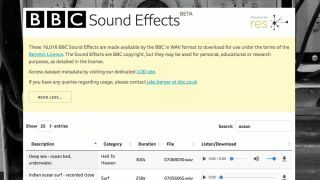 MusicRadar's best of 2018: There can be few organisations that have used more sound effects than the BBC, so there’s bound to be great interest in the news that the corporation has now made more than 16,000 of its FX available for free download. The archive is easily searchable, and a quick browse confirms that there’s a wide variety of content, ranging from the atmospheric to the downright obscure. Each sample can be previewed and both its duration and filename are listed. The service is currently in beta, but you can dive in and start downloading right now on the BBC Sound Effects website. Don’t forget that MusicRadar also offers its own library of free samples in the form of SampleRadar, and that this content can be in commercial recordings royalty-free.